A Matrix Premium base coat/clear coat finish was recently applied in the combination of Midnight Blue Metallic and white. New trim seals were fitted throughout. The lift-off top fiberglass top features tinted windows and a dealer-installed chrome luggage rack. Dealer-optioned 15" aluminum wheels wear new BFGoodrich All-Terrain T/A tires. The Silverado option package included chrome bumpers and additional brightwork as well as high-backed bucket seats and other interior appointments. It's reported that the Blazer retains its original body panels. The front seats have been reupholstered with new old-stock vinyl covers. New carpeting has been installed, and the forward footwells are protected with blue GM logo mats. The powered rear window works as it should thanks to a new motor, and the spare wheel cover is a replacement matching the blue interior. A "Comfortilt" steering wheel fronts an instrument cluster with a new aluminum bezel. The speedometer registers up to 85 mph, and the 5-digit odometer shows 72k miles. Features include factory-installed cruise control and a stock AM/FM cassette stereo with new speakers. 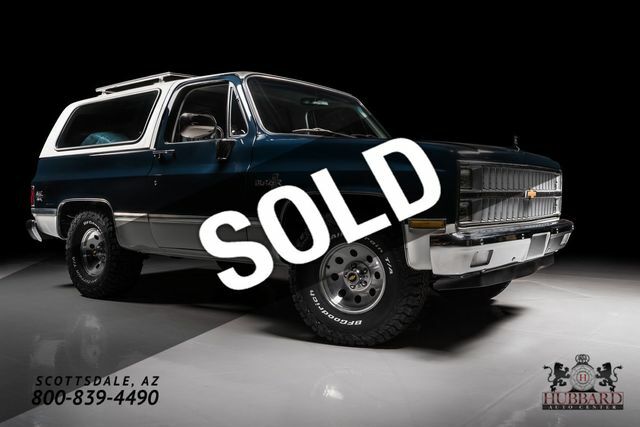 Complete restoration, rare 427/435HP automatic transmission!